In some ways, Loki is the perfect villain. 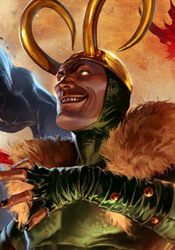 Serving no one but himself, the god of mischief delights in turning allies on each other, twisting knives, exploiting trust and simply causing as much mischief and panic as he can in as little time as possible. From all indications, we're in the middle of witnessing his magnum opus. A master manipulator, he's effectively turned both Doom and Norman Osborn against his adopted home of Asgard, while at the same time maintaining his spot at the right hand of Balder, present ruler of the realm. What does he stand to gain? Well, what's wrong with a little chaos from time to time? In the issue's first panel, Doom says it all – "You remain Loki, Loki." Really, that's all this issue adds up to. It's just Loki being Loki: toying with people for the fun of it, throwing a wild card into the mix for no reason other than to see who will get screwed, all while wearing that snide, pompous, ineffable sneer. Loki makes for a fantastic instigator, but as the central figure of a story, he's fairly lacking. He's one-dimensional, always scheming and misleading, but mixing his messages just enough to trick everyone he meets into following along. Like a pinch of salt, he's great in small doses but too much spoils the lot. Kieron Gillen's tie-in to the latest, greatest merry Marvel crossover to end all crossovers can't be chastised for avoiding answers. In fact, this issue solves a number of riddles that had been floating around Siege since it was in the setup stages almost a year ago. The problem is, every last one of those answers boils down to "Loki did it just to mess with someone." Gillen's only real innovation in these twenty-four pages is the casual wheeling and dealing Loki does with Mephisto, a friendly face-off between the publisher's two most conniving personalities. Naturally, their clash utilizes the pen, not the sword, as they each attempt to one-up the other with escape clauses and fine print. It's a fun little competition, if not a particularly long or volatile one. I didn't care much for Jamie McKelvie's artwork at first glance, but as the issue unfolded it slowly started to grow on me. I'll attribute that to his similarities to Steve Dillon, whose work I also took some time to really appreciate. McKelvie and Dillon both give their subjects a very pedestrian, everyday appearance – uncomplicated but rich in character. That's worked very well for Dillon over the years, since his cast is usually filled out with casually dressed civilians. Seeing Loki, Doom and Mephisto with that kind of a treatment, on the other hand, seems to spotlight just how crazy their get-ups really are. If you can get past that, the quality of McKelvie's facial expressions will treat you well.